Jon Stewart holds a rally to restore sanity in Washington D.C. and who appears onstage? Cat Stevens a.k.a. 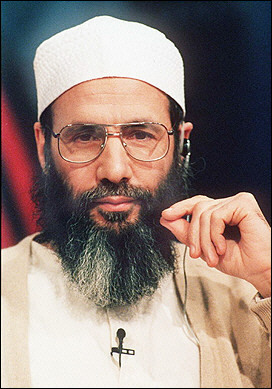 Yusuf Islam, supporter of the fatwa suborning the international murder of Salman Rushdie for the crime of writing a book, and an advocate of stoning women for adultery. Of the spectacle, Rushdie said in a message to Nick Cohen, “I’ve always liked Stewart and Colbert but what on earth was Cat Yusuf Stevens Islam doing on that stage? If he’s a ‘good Muslim’ like Kareem Abdul-Jabbar then I’m the Great Pumpkin. Happy Halloween." He told me in 1997, eight years after saying on TV that Rushdie should be lynched, that he was in favour of stoning women to death for adultery. He also reconfirmed his position on Rushdie. He set up the Islamia school in Brent, which is currently undergoing council-backed expansion. Its mission statement three years ago explicitly stated that its aim was to bring about the submission of the individual, the community and the world at large to Islam. For this aim it now receives state funding. Its an incubator of the most bonkers religious extremism and segregation, and is particularly strong on the public erasure of women. Why do people go to such lengths to ignore these aspects of Yusuf Islam's character and philosophy? I like the Daily Show, and the Colbert Report, but this criticism cannot go unmade. The 'Rally to Restore Sanity' turned out a wet, masturbatory, false-equivalence-fest in which Stewart, by design, paraded himself the pied piper of sanity and civility, all the while happy to appear with an Islamist reactionary who is violently against freedom of speech. It does wonders for that message of tolerance, doesn't it? Tolerance of intolerance is cowardice. Freedom of speech is everything.